Ivan Grundahl 'Gaby' jacket in black wool gabardine. Round neck with off-white trim and raw edging. Slightly off-centre 4 button fastening. 2 pockets with flaps. The cuffs are vented with inset of poplin and raw edge finish. At the rear the central seam, extends out and has raw edges. A single vent with raw edging. At the hem there are 2 layers the outside layer with raw edging and the inside layer, extends below the outer layer and also has raw edging. 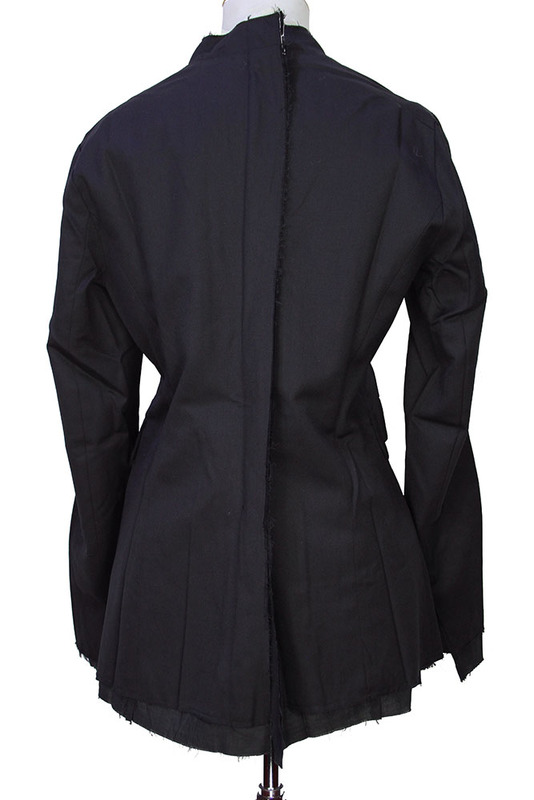 Fully lined in black poplin. A beautiful jacket that matches the trousers in the same fabric.